facility that attracts hundreds of climbers a day. Nearby businesses are starting to cater to these customers. 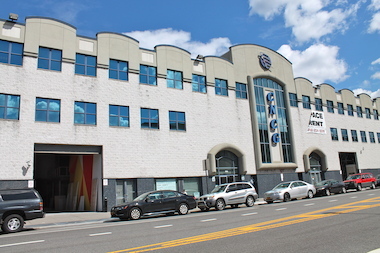 The rock-climbing gym in Long Island City, Queens seems to be single-handedly changing the retail environment along a historically industrial stretch of this community, according to a recent article in Crain’s. I was particularly interested in the take-away’s from this article after a presentation we made last night to a small town of about 12,000 in Upstate New York. The community is looking for ways to drive pedestrian traffic to their small but interesting Main Street. Over the course of our lively discussion with City and County officials, business owners and residents, we agreed that events, activities and destination drivers are key to bringing people downtown to shop at the growing cluster of stores along Main Street. While there are many aspects to revitalization – one participant likened it to putting together a complicated puzzle – at least part of the revitalization effort will require supporting the businesses that have recently opened and making sure they succeed. In its most basic form, this will require getting more people in the door to shop and eat. That means putting on not only events – which we acknowledge can be challenging to manage and sustain, not to mention execute successfully – but also identifying opportunities to enhance the downtown experience through entertainment anchors. And this is where the rock-climbing gym in Long Island City comes in. The impact of this one business on the corridor – particularly with respect to driving demand for auxiliary businesses – has been tremendous and offers a few lessons learned. Merchants communicated with one another and coordinated hours in a way that benefited both. The owner of Cliffs at LIC personally approached Josh Bowen, the owner of John Brown’s Smokehouse to tell him that his patrons, numbering about 500 on a typical weeknight, were often leaving their climbing sessions hungry and with no place to go. It is great that is happened in this community organically. What this speaks to is the need to create opportunities for merchants to communicate with one another on a regular basis to identify and act upon synergies. Do your merchants have a venue to do this? We worked in a community many years ago where the local restaurants and local theater were working at cross-purposes. The restaurateurs often didn’t know when there was a show going on – and subsequently were understaffed and slammed with customers on nights when they didn’t expect it. As a result, customers were often late for their shows. Do you think many people came back to recreate this harrowing experience? I think not. In this community, it became clear how important is was to create simple communication tools – monthly meetings of a newly formed hospitality committee (managed and staffed by the local Business Improvement District) and an on-line event calendar distributed via email to said hospitality committee were all ways to improve communication among businesses which in turn improved the experience for customers. Ultimately some of this comes down to the need to establish and cultivate administrative capacity to make sure these conversations happen, and that they happen frequently enough to troubleshoot issues that come up. The opportunity to build on the ‘rock-climbing” retail micro-climate that is developing. By understanding what this niche market wants and needs, local business owners can capitalize on the spending potential of climbers. Whether this be food after a good session, or craft-beer, or coffee or a store selling climbing gear…all of these businesses can begin to form an ecosystem that is driven by the destination driver – in this case the gym. The need to invest in experiential opportunities. I talk alot about the need to incorporate both impulse and ambient entertainment in our downtown environments. Think great public spaces that engage the user (one of my recent favorites is Campus Martius Park in downtown Detroit. Foosball, performers, music, basketball) these are all things that make going downtown more than just about buying goods. Downtown Detroit is a fun diversion that activates place. If we rely on downtown to be solely about the purchase – we are destined to lose the battle against retailers who offer wider selection at cheaper prices – either at the local big box shop or on-line. But experience is not just about what happens on the street, it also mean experiential retail, and the rock-climbing gym is a great example of this. In fact, a super-regional mall outside NYC recently revamped its interior courtyard with a ropes course. Even the big guys are internalizing these lessons. A rock-climbing gym is admittedly not for every community – but the concept of identifying a a unique offering or experience that drives pedestrian traffic, which in turn enhances the retail sales of nearby businesses, is a basic retail lesson for all of us.